A timeless way to add class to paper cocktail, luncheon or dinner napkins. 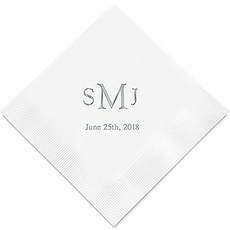 When it comes to personalized napkins, it does not get any classier than those personalized with a monogram. 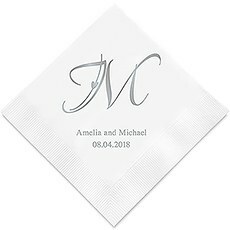 Our Monogrammed Napkins add an elegant touch to weddings, baby showers, birthdays, anniversaries and more. 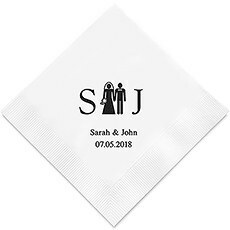 These high-quality paper napkins are a practical, budget-friendly way to add style to your celebration and to show your guests that you put thought and effort into every detail. Quality-made, guests will assume you spent a lot more than you did! We have several lovely styles to choose from. In addition, we also have an array of decorative initials that are equally charming. Select initials surrounded by intricate flourishes for formal galas to ones in edgier, geometric designs for casual settings. 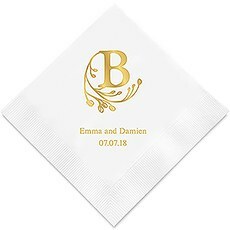 Whichever style you select, we let you play the role of designer by giving you the flexibility to customize these napkins in your preferred background color and foil imprint. With lots of neutral to vibrant napkin colors available and dozens of print hues, finding the combination that will blend in seamlessly with your party theme and decorating scheme is easy.Dress up any candy bar, food buffet or table setting with our monogrammed paper napkins. They add a splash of color and are an affordable alternative to expensive cloth napkins, yet provide an equally stunning effect. Our goal is to help you accent your venue with an upscale touch without sending you over budget; use them for all the festivities leading up to your special day, including your bridal shower, rehearsal dinner and wedding reception for continuity. 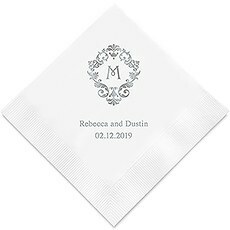 In addition to the monograms and initials, our napkins can be further personalized with a name or names and a date. 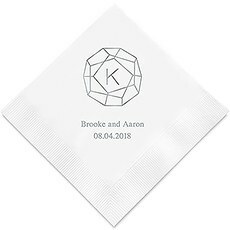 You can also get creative and have a fun saying or sweet message added.From classic to modern to whimsical, our custom monogrammed napkins will add that decorative touch that will get the attention of your guests.